Gameloft just released an update to their Free-To-Play My Little Pony – Friendship Is Magic iOS game which adds a new rhythm mini game featuring the Equestria Girls. In the Equestria Girls animated feature film, Princess Twilight Sparkle’s crown is stolen and she follows the thief, Sunset Shimmer into a mirror which is a portal to another world in which she becomes human. There she discovers human versions of all her pony friends and a lot of things happen as she tries to get back her crown and save Canterlot. It is currently my 4 and 6 year-old daughters’ favorite film and as such I’ve seen it about 20 times by now myself…it is actually pretty entertaining. So needless to say I was excited to see this update, which consists a fairly generic music rhythm game with a MLP theme where you first select one of three songs related to the film, which in order of difficulty are: the Opening Theme, This Strange Wolrd and EG Stomp. 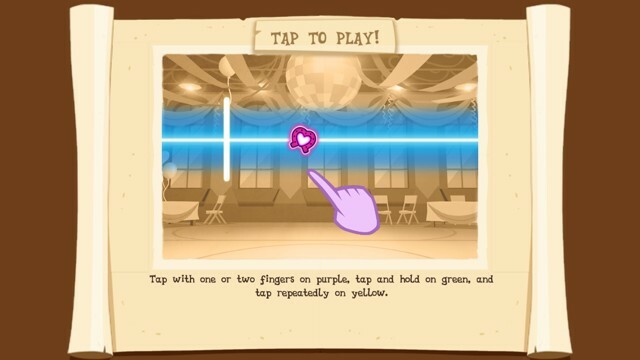 Then you select your favorite (human) pony and if you’d like to spend coins or gems to increase the reward multiplier. While the chosen song is playing, various colored shapes will slide across the screen and you need to tap, tap and hold or repeatedly tap the screen at just the right time with one or two fingers depending on the color and quantity of the current object. It is fun and even a bit challenging at times and if you’ve seen the film, you will recognize the music. However, while both the game and this new update are free, your enjoyment of the Equestria Girls update will be SEVERELY hampered by the game’s horrible freemium model with outrageously long wait timers between plays unless you want to pony up (pun intended) a pile of gems to speed things along. 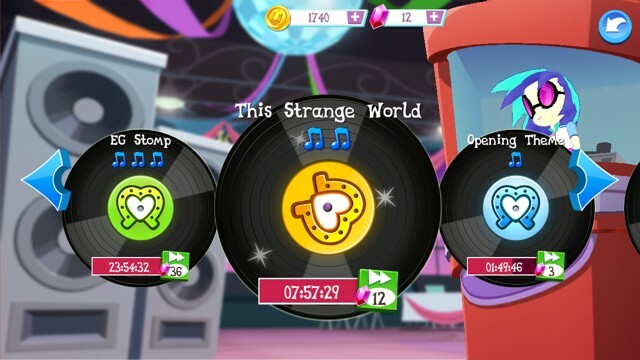 After playing the Opening Theme ONCE, you will have to wait another THREE HOURS before you can even attempt the song again and the timers for This Strange World and EG Stomp are even more insane, clocking in at 8 hours and 24 hours respectively, unless of course you want to spend as much as 30+ gems to speed things up. They should really let you play as much as you want if you are willing to forgo any rewards and just want to enjoy the new mini game. I really hope I’m just missing something and this option exists. What kid is realistically only going to play a song once and then wait for 24 hours? At least you can listen to all the songs as much as you want for free from the song selection screen, you just can’t play the mini game.. 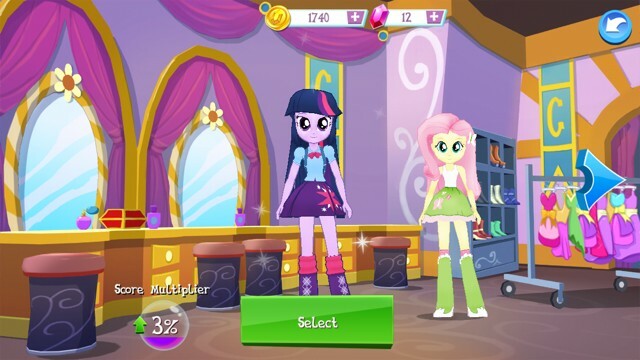 I wish Gameloft would have just released this as a separate app so my girls (who are HUGE My Little Pony Fans, and especially Equestria Girls) could actually enjoy it. 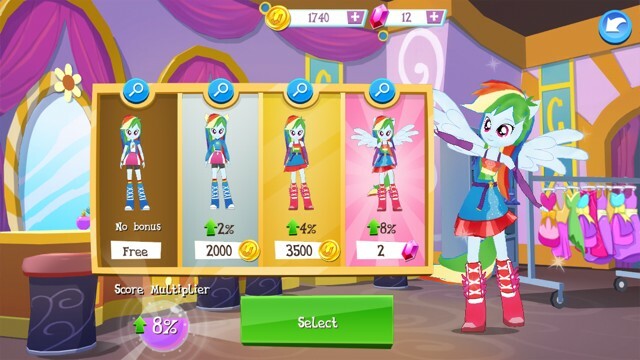 Unfortunately it seems like Gameloft is more concerned with creating another means of separating My Little Pony fans from their cash than giving them something they can enjoy at will. I’m guessing they never once handed this to one of their own daughters and asked them what they thought of these long time constraints, but then again, their accounts are probably pre-loaded with plenty of gems. It is this very reason that I haven’t even bother showing my daughters this game or this update…which is a real shame. You can read our original review of the game as well as an Open Letter to Gameloft written by one of our disappointed staff Bronies, both of which severely criticized the game’s greedy freemium model.